Virginia Attorney General Joins Climate Change Coalition | News and Features | Style Weekly - Richmond, VA local news, arts, and events. 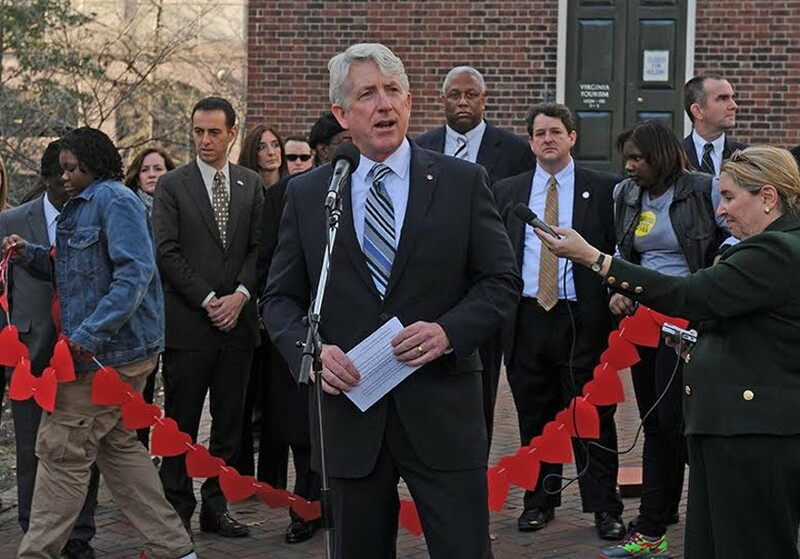 Scott Elmquist Mark Herring speaks at a vigil to honor gun violence victims at the Capitol Bell Tower in 2015. Attorney General Mark Herring joined a coalition to combat climate change today, aligning with former Vice President Al Gore and 17 other high-ranking state law enforcement officers. Part of the group’s agenda is to defend the U.S. Environmental Protection Agency’s Clean Power Plan, which is designed to limit carbon dioxide emissions believed to contribute to global warming. The plan calls for Virginia to reduce its carbon dioxide emissions by 32 percent by 2030 compared with 2005 levels. Doing so involves switching coal-fired power plants to natural gas, building nuclear plants or ones using renewable energy and making conservation plans. Herring’s move, announced in New York, flies against sentiment among Republican legislators in the General Assembly who passed a law that gives the General Assembly the power to decide how the state deals with the Clean Power Plan. Gov. Terry McAuliffe vetoed the bill March 2. McAuliffe and Herring are Democrats. The U.S. Supreme Court has ruled to hold off implementing the Clean Power Plan until several legal challenges against it are settled. Other attorneys general who joined the coalition include Brian E. Frosh of Maryland Eric Schneiderman of New York and William Sorrell of Vermont.